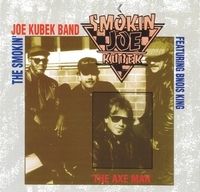 SMOKIN’ JOE KUBEK has been a veteran of the U.S. blues scene from the 1970’s on. He is strongly influenced by the “Kings” of blues guitar: B.B., Freddie and Albert. Despite his two decades of experience as a blues performer, this compact disc is Joey’s very first release. When I First heard these recordings, I was really knocked out by Joe’s tremendous guitar technique: dynamic and clear, fluent and yet with lotsa feeling. In fact his virtuosity and distinctive guitars ound remind me of Stevie Ray Vaughan and Ronnie Earl at times. The singer on this compact disc is the black second guitarist, BNOIS KING. Mr. King hails from Louisiana and is in his mid forties. Bnois is not only a gifted guitar player in his own right, but also a fine clear blues shouter with an easy sense of rhythm. I admit, I would have liked to hear more originals on this First Smokin’ Joe Kubek CD. For this (low budget) production the band sticked to well known stage repertoire which they could easily record in limited studio time. However, the covers of other blues men’s classics on this CD all sound fresh to me and some stunning tracks (f.i. “Little Wheel” and “Back Door Man”) have very original arrangements. Personally I think that Joe can easily compete wwith today’s best white blues guitarists such as Ronnie Earl and Tom Principato or fellow Texans such as Danny Freeman and Anson Funderburgh.